Hydrogrossular garnet is typically translucent to opaque and is usually available as cabochons, but on rare occasion may be found as transparent, faceted gemstones. 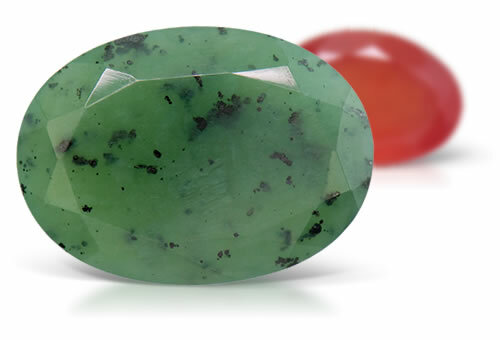 Generally seen as green to blue-green, pink, white, and gray, this gemstone may contain small dark gray to black inclusions and may look similar to jade if opaque. Hydrogrossular is a variety of grossular garnet where hydroxide partially replaces silica. RI, spectrum, appearance and maybe SG. If the stone is mixed with idocrase a clear identification is not possible. Misnomers: African jade or Transvaal jade, garnet jade. Might have black magnetite inclusions that resemble pepper.